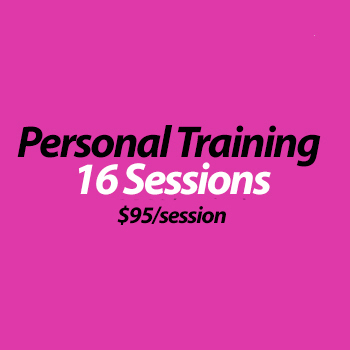 16 personal training sessions with one of the Body Beautiful Coaches. The sessions take place at our 266 King Street West location. Personal training sessions that are not cancelled at least 24 hours prior to the scheduled time will be forfeited. The only exception to this policy will be a medical emergency with documentation. Failure to give proper notice (24 hour notice) three or more times during the same semester (your purchased package) will require you to go to the end of our wait-list when signing up for additional sessions. Individuals registering for personal training must complete all personal training sessions by the expiration date of the training package. Any sessions that remain after the expiration date will be forfeited. The session packages will expire at the end of the semester that they were purchased. In the event the above should occur, a request to put sessions "on hold" may be submitted to info@buildmybodybeautiful.com with and supporting documentation. Sessions can be put "on hold" for only once per 6 (six) months and for a maximum of (3) three months at one time. Please note there are no refunds or partial refunds are available on any Personal Training Packages. In the event that unexpected circumstances should occur (job transfer, injury, move, medical reasons etc) and you are you not be able to continue your personal training sessions, you may request to have your remaining sessions transferred to someone else. An email request must be submitted to info@buildmybodybeautiful.com with reason for transfer and supporting documentation. Transfers are subject to our distraction and approval. program through the Body Beautiful app. Programs created based on the agreed number of sessions you will be attending weekly with your coach and are updated every 8 sessions used. Personal training sessions must be paid in full 48 hours prior to scheduling your first session of each package with the coach. All payments must be completed through the Build My Body Beautiful website or arranged with Ana Plenter Build My Body Beautiful (BMBB) Principal directly. Ana Plenter and Build My Body Beautiful are not responsible for any payments handled in any other manner, or by any other party (this includes payments made directly to other BMBB coaches), without such arrangements made by the Client and Ana Plenter in advance. If the client arrives more than 15 minutes late for a scheduled appointment, the coach may leave the premise and the appointment will be forfeited. Participants may be required to have medical clearance (letter by physician) if deemed necessary by their Par-Q and health history information. In the event where your coach may not be available for your scheduled session(s) or to complete your session(s), Build My Body Beautiful reserves the right to assign another BMBB coach.